I went to Panera Bread and had their French onion soup the other day. It reminded me of my mother’s soup, but it is not one of the recipes I copied down when I left home. I thought I could do better than Panera, so I decided to gave it a try. 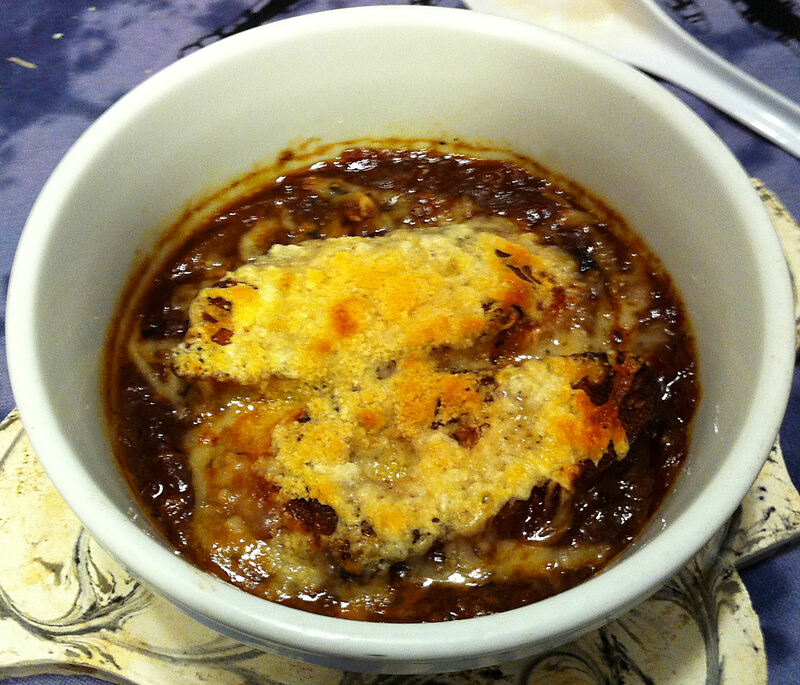 One of the stories in my family was that when my mother met my father, she could make two dishes—French onion soup and burned water. With four older sisters, she had never learned to cook at home. My father did not so much teach my mother to cook, but he taught her how to learn to cook. Not being bound to her “home” cuisine, she was free to explore world cuisine—long before it became fashionable. Some food blogs only post recipes after they have tried them several times. I rarely make the same dish the same way twice—I am constantly tinkering even with “successful” recipes. When I have a semi-failure I am more likely to post the recipe—and rather than hiding my errors—adding comments about what I did wrong and how I can fix it the next time. This is the lesson that my father taught my mother—learn from your mistakes. 1. Put the ghee in a large heavy bottomed pot over medium high heat. Tip: I like to use butter in many of my dishes—as do the French—but there is always the danger of “browning” your butter. For some recipes this is a good thing, but clarified butter (ghee) eliminates this problem during a very long sauté. 2. Sauté the onions with the salt, stirring often, until well caramelized. Tip: For this amount of onions this can take 40-50 minutes. Stir frequently, so that the onions do not stick to the bottom of the pot and burn. If necessary, splash in a bit of sherry to deglaze any spots that have begun to stick. Note: I actually made my dish with seven large onions. I started with a 10 quart pot full of onions that eventually cooked down to about a quart and a half. This turned out to be “too much of a good thing.” As onions cook, they release their sugars and my dish came out overly sweet and onion-y. I have reduced the amount of onions in this recipe to compensate for that flaw. 3. Pull the onions to the sides of the pot and add the garlic to the hole in the center. 4. Sauté the garlic for one minute and mix it into the onions. 5. Add the sherry and make sure that the bottom of the pot is completely deglazed. Tip: Any bits of onion that are stuck to the bottom of the pot might burn, giving your soup a charred taste. 6. Stir in the bay leaves, thyme, black pepper, beef broth, chicken broth, and demi glace. Tip: The chefs at Cooks Illustrated found that using strait canned beef broth left their pot roast tasting “sour.” They found that adding some chicken broth counteracted this problem. 7. Bring the pot to a boil, cover and reduce the heat. Simmer the soup for 30 minutes. 8. Slice the baguette into thick slices and toast them until they are lightly browned. Tip: Some people may choose to brush the bread with olive oil, but it is not necessary. Also, unless you have a very large loaf of bread, you probably will need two slices for each bowl. When laid on top of the soup, the bread should cover most of the surface area. Note: There are special bowls made just for French onion soup, but any heavy, oven-proof bowl that will stand up to a few minutes of broiling will do. 9. Serve the soup into individual bowls and lay the bread on top of the soup. Tip: Discard the bay leaves. 10. Scatter a bit of the cheese on top of the bread and put the bowl in the broiler four inches from the heating element. 11. Broil until the cheese is melted and bubbling. Tip: Remember to use oven mitts to remove the bowls from the oven, as they will be very hot. 12. Transfer the bowls to individual trivets in front of your diners, while still piping hot.